Brighton & Hove Albion will have Pascal Gross and Solly March available for tomorrow's Premier League home match with Cardiff. The Seagulls are five points ahead of third-from-bottom Cardiff after three successive league defeats. Gross has missed Brighton's last seven games with a hamstring injury and March has been out for two matches with a calf problem. On team news, Albion boss Chris Hughton said: "We're okay and there's no problems from Saturday. "At this moment, Anthony Knockaert is not available but everyone else is available." On tomorrow's match, Hughton said: "It's a big game and the fact we didn't get the result we wanted on Saturday makes it an even bigger game. "It was always going to be. When you're playing against the teams in the same sort of area that you are in the league, they become the games that probably have a little bit more importance in people's eyes." 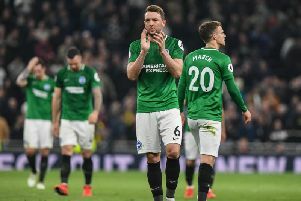 Brighton's 5-0 defeat to Bournemouth was a fourth successive loss without scoring and on his side's form Hughton said: "The first one and the obvious one is we're playing in a very competitive league. We are newcomers as such to this league and it's the difficulties, the ups and downs and it's about adjusting to the qualities in this league. "You look at form and we haven't scored enough goals and probably the hallmark of this team and where we have been able to be solid and stay in games has occasionally let us down. "We are not so far away from being on the back of a good result against Huddersfield, a very good result at Palace and a good performance at Wembley, which was only a week and a half ago. "These are the areas as a manager and as a team you have to iron out. They are the ups and downs that come with football. The good thing about our game is you always get an opportunity to turn things around."